Property 1: Cottage with Heated Salt water pool in private & peaceful setting. Property 7: House 8 places 300m from the space CARAT. Property 34: Luxury villa with private pool overlooking a challenging 18-hole golf course. 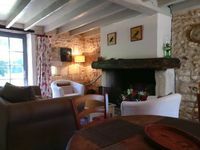 Property 35: Chez Marot is a very comfortable light and atmospheric one bedroom gite. Property 37: Lovely villa with a lot of privacy, swimming pools, golf, and a swimming lake ! Property 39: Luxury detached villa with heated pool overlooking a challenging golf course. Property 40: A delightful house in a quiet area near the border of the Dordogne. Property 41: Luxury villa with private pool overlooking a challenging 18-hole golf course. Property 45: Luxury villa with heated pool on golf with lots of privacy and panoramic views. Property 46: Spacious luxury villa with private heated pool and sauna at an golf course. Property 50: Spacious villa with private swimming pool on a challenging 18-hole golf course.